Professional Liability Matters – Professional Liability Matters Named Best Niche and Specialty Blog of 2018! 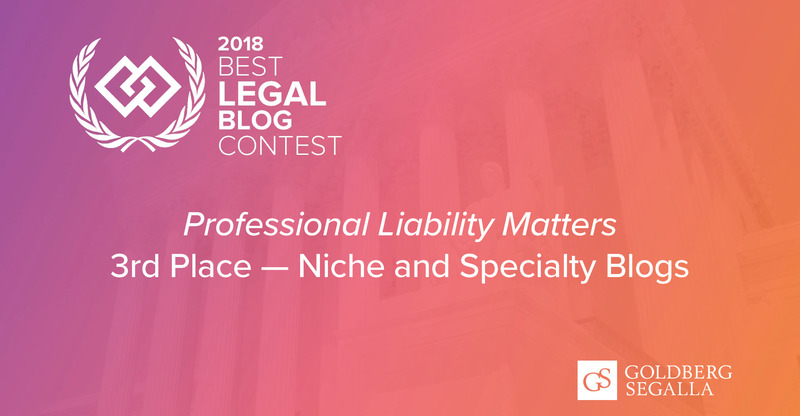 Professional Liability Matters Named Best Niche and Specialty Blog of 2018! We are pleased to announce that the Professional Liability Matters blog has been named among the best niche and specialty blog in the country earning 3rd place overall in The Expert Institute’s Best Legal Blog Contest for 2018! The Expert Institute — a leading legal service provider for identifying, verifying, and retaining expert witnesses — holds this annual contest to vet and recognize the best legal blogs out of the thousands that are on the web. In the 2018 Best Legal Blogs Contest — what the Institute called its “largest and most diverse” yet — four of Goldberg Segalla’s blogs took top-three spots in three categories, niche and specialty, litigation, and legal news. A huge thank you goes out to all of our readers who made this honor possible. We certainly could not have done it without you and truly appreciate all your support. We promise to continue provide the latest trends, legal developments, and breaking news impacting the professional liability community. Next ArticleIs There a Duty to Advise?